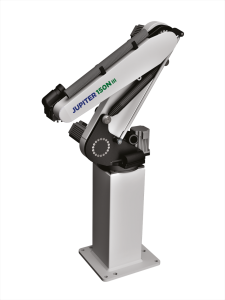 JUPITER 150N III is the third-generation anthropomorphic robot from Dierre Robotics. Improved construction compared with the NI and NII versions, still with the characteristic construction in aluminium alloy and powder coated steel, it offers extreme rigidity at all working speeds. The construction boasts precise joints and extremely powerful motors. The 4 ½ and 5 ½ axes versions with motion maintenance on the Cartesian plane by means of rigid transmission allow a very easy and intuitive programming, outside the rules. 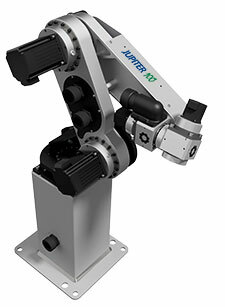 The robot adapts to every need where precision and high angular accelerations are an essential requirement; the management of joint movements and Cartesian kinematics is entrusted as always to the CoordinAx motion system by Dierre Robotics. JUPITER 100 is the new high definition arm robot of Dierre Robotics. Developed on the proven technological basis of its big brother (version 150NIII), it presents excellent technical requirements. The executive optimization and the reduction of work footprint make the Jupiter 100 an extremely powerful, rigid and 100% reliable machine, perfect for the pick and place. Fast, sharp and exact movements are at the basis of the executive concept of this robot. As for the other versions, the 4½ and 5½ axes models, the unit permit a rapid configuration within everyone’s reach, The management of the movements is carried out as always by CoordinAx motion system by Dierre Robotics. The robot can be set up on the floor, wall, ceiling or directly on line production.